Virgin Trains has been operating for over 12 years and are one of the most experienced train companies in Britain. Virgin Trains' route extends from London all the way to Glasgow in Scotland, connecting the two cities with a journey time of 4.5 hours. Virgin Trains operates rail services in and out of London Euston, acting as a gateway to the 401 mile-long West Coast Main Line. The West Coast Main Line stretches from London to the North of England, Scotland, and West Wales,taking in the spectacular scenery of the Lake District and North Wales Coastline. Virgin trains run services to many major mainline stations in the UK, including: Birmingham New Street, Liverpool Lime Street, Manchester Piccadilly, Preston, Holyhead, Glasgow Central, and Edinburgh. 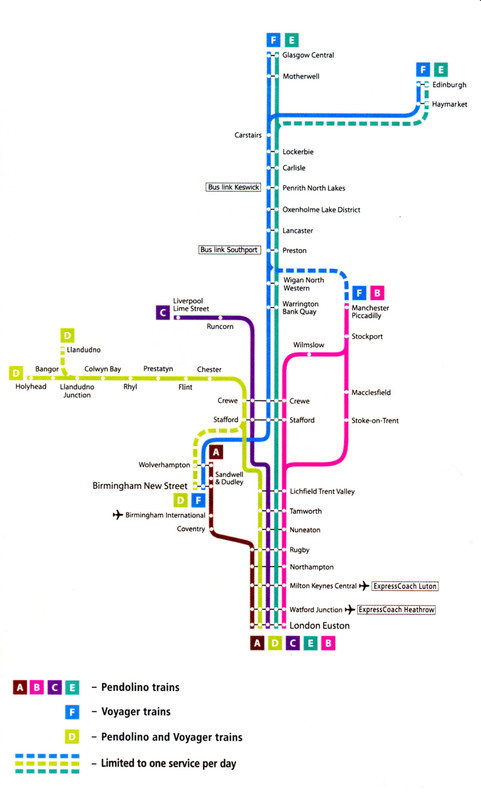 The Virgin Trains route also passes through other popular destinations including The Eastern lakes of the Lake District, Northampton, Crewe, Watford, Milton Keynes, Stafford and Lancaster. *Please note that the fares shown above are single advance fares for travel up to 12 weeks in advance from 08.01.16. Advance fares are sold subject to availability and are not available on all routes. Virgin Trains operate two different kinds of train, Super Voyager and Pendolino trains. Pendolino trains run between London Euston. Birmingham, Manchester, Liverpool and Glasgow. Super Voyager trains run between Euston, Chester, North Wales, the West Midlands and Scotland. Virgin Trains First class travellers can enjoy reclining seats, more leg room, a reading light, power sockets, a table and free wifi*. Award-winning food is served Monday to Friday with a 'great British Breakfast' before 10am and a full evening meal menu between 17.00 and 19.00*. All Virgin Business, First Class Open and Advance First ticket holders are entitled to access to the exclusive designer, First Class lounges on their day of travel. First class lounges may be found at: London Euston, Birmingham Intl, Birmingham New Street, Coventry, Crewe, Liverpool Lime Street, Manchester Piccadilly, Runcorn, Stoke-on-Trent and Wolverhampton.